Emmy Mom--One Day at a Time: Bring on the Glitter! This week my mom is coming into town! Actually my mom, dad and little sister are coming. I am very excited to see them all and I am sure they are excited to be leaving the 13 degree weather in Chicago to the beautiful 70 degree Southern California weather. My parents will be here for a while and so of course that means my mom and I need to craft! We love tole painting, painting Christmas balls, making wreaths and well just about anything we can think of. My husband may be shuddering right about now as he remembers all to well this.... Several years ago, pre-kids when we lived in Utah; my parents came to visit and we went to Thanksgiving Point. 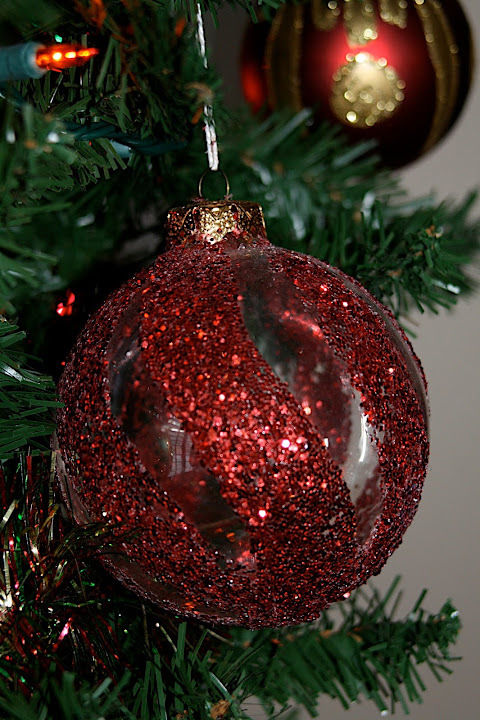 The shops were filled with wonderful Christmas decorations including a ball very much like the one pictured above. We saw it and thought it was beautiful, until we saw the price. We can make that! And that is when the adventure began. We may or may not have driven to three different stores looking for the right balls. We may or may not have spent a lot of time making a paper template to cover the blank spots on the ball. We may or may not have first used glitter glue which just didn't work or stick... so we may or may not have gone back to the store for different supplies. We may or may not have finally got the balls done to wake up the next morning to find that the glitter had stayed together but sort of peeled off of the balls like peeling a banana. Eric may or may not remind us of these balls every time we talk about making a craft together. But as you can see we did finally get them to work.... I honestly can't remember how though. All I know is this ball that now hangs on my tree will always bring with it a lot of good memories and some I may or may not be trying to forget! I love that story. Your ornaments will bring back good memories every time you see them. If you bought them from a store, you would wonder in a few years where you got them. Cute story. I almost never buy crafty things because I imagine I can make them myself. Then I end up with a ton of supplies etc...that cost more than the one item. But I learn something every time! You and your mom crafting sound a lot like me and my mom quilting. it may or may not take multiple trips to more then one store but in the end the memories are cherished and the product enjoyed. I love the ball it is gorgeous. What a fun post! I love the glitter ball too! SOOO pretty. You're putting me in the mood to make something for my tree! Yay! Your family is coming to visit you! That is so exciting. I love that you and your mother have traditions of crafting when you get together. Will your sister be joining in the fun, or is it strictly a you and your mother kind of thing? I wish I were more crafty... I am learning, though, and that is what is important. That is exactly why I love homemade ornaments ... when you look at them, you remember what went into creating them and that is what gives them meaning! Have so much fun with your family! I'm sure they'll stay in the warmth as long as possible! Cute story, Emmy. I see your craftiness comes from your mother or so I'm guessing, the ball is so pretty. hahahahahahaha, LOVE the way you wrote this!!!!! I remember making ornaments when I was kid, with sequins and beads and pins. I also remember very sore thumbs. At least yours didn't cause pain...well maybe a little in the rear. ;) It is very pretty tho. That is so great that you and your mom share that. What a cute post =) Cute ornament too! Lol. I myself am very crafty, but thinking of my husband joining in may or may not make me cringe! LOL!